Manhattan Youth Recreation and Resources, Inc. provides the highest quality childcare and After-School programs plus academic, recreational and cultural activities for children, families and individuals who live or work in Manhattan, regardless of income. Our programs stimulate, challenge and strengthen children, teens, adults, seniors and families. Our services respond to the needs of our community. Our primary activities remain Camp, After-School and our Community Center. We also engage in a number of civic issues that impact community life in Manhattan. We started providing services to a small but growing Lower Manhattan Community. Renowned as the financial center of the world, Lower Manhattan was rarely celebrated as the vital community of families, babies, toddlers and children of all ages that it is. Moreover, the well-being of our families is vital to the well-being of Lower Manhattan; large corporations, hundreds of small businesses, increasing numbers of cultural attractions and, by extension, to our city and nation. While average family income here is above average, averages mask the extreme range of incomes and the needs of many Lower Manhattan families - needs that predate the devastation of 9/11 and that have grown since. In 2008 we opened the Downtown Community Center to much acclaim. Most recently we have spread our wings to include After-School middle school programs throughout 24 locations in Manhattan. 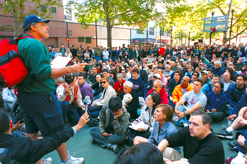 We were founded in 1986 when there was virtually nothing for youth to do in Lower Manhattan. Since then, we have grown into a multi-service agency offering one of the largest day camp programs in New York, thirty two after school programs serving over 5,000 school kids daily, and a bustling community center with sports, a swimming pool, diverse cultural programs, academic support and more. We've always been advocates for our community - we helped establish Hudson River Park, new Lower Manhattan public schools, and the Downtown Giants, Soccer and Little Leagues. We inaugurated our Manhattan Youth After-School Programs when our community's first public elementary school opened in 1989. We leased pool facilities in 1991 for our first Aquatics Program including swim lessons, family and senior swim programs, and in 1992 we began our Downtown Day Camps to give kids of working families full days of great activities during the summer. In 1995 we leased and renovated the derelict Pier 25 to be an outdoor recreation site, and by 2001 we were serving 20,000 people a year at Pier 25 and operating after-school programs in all four existing Lower Manhattan public elementary and middle schools. On September 11, 2001 Manhattan Youth responded quickly to tragic events that plunged Lower Manhattan into chaos. We organized the first community meeting for 1,000 people on 9/15 even though our offices were in the "hot zone," our pool was destroyed, all of our schools were closed, our evening recreation center was shut down, much of our staff was displaced, and our pier was taken over for debris removal. We dispatched our staff to our kids' temporary school assignments across the city so children would see familiar after-school faces, we organized informational meetings, arranged transportation in and out of the restricted area, and provided necessities to people whose homes were cut off from the outside world. We received national recognition for our efforts. Since 9/11, we have worked hard to meet the needs of resurgent residential neighborhoods in Lower Manhattan. Children from nearly 2,000 families choose from a wide range of sports, swimming, academic enrichment and arts programming. We raised $12 million to design, build and outfit our new Downtown Community Center, which opened in June of 2008, and in 2011, we returned to the newly-reconstructed Pier 25 to provide recreational activities and healthy food concessions. On October 29, 2012, Hurricane Sandy hit the New York City region with a wind-driven surge of water abetted by a full-moon high tide that pushed water levels to unprecedented heights. Waterfront communities in Staten Island, Long Island and along the New Jersey shore were devastated, and the cost in lives lost and destruction of property was unimaginable. Much of Lower Manhattan and the Lower East Side were flooded as well. Power was out for a significant portion of our community for days, and many commercial and residential buildings were uninhabitable for months. Warren Street in front of our community center was under three to four feet of water which found its way into our Great Hall and down to our cellar Aquatics level. More significantly, the flood breached the sandbags protecting the parking garage adjacent to our Center. The garage area next to our sub-cellar level filled with flood water, which eventually burst through three sets of steel doors leading to our boiler room and our Arts and Culture level, ripping through walls and tossing furnishings and equipment around like rubber duckies in a bathtub. When it was all over, we had nearly 20 feet of standing salt water in our sub-cellar, ruined ceilings, floors and walls on our cellar Aquatics level, and ruined floors and walls on our street level. On Tuesday, we assessed the situation and began cleaning up. We found pumps in New Jersey and ran four of them day and night for four days to pump out the water. With the help of our Downtown Community, we then removed more than 40 dumpsters of program equipment, furniture, drywall, insulation and more, and we cleaned and treated our entire sub-cellar level - including the air. We replaced boilers, pumps, electrical panels, walls, flooring etc., and we opened our pool and upper three floors on January 2nd. A year later, we opened our new Arts, Culture, Science and Technology Center where youth could enjoy our new digital media lab and recording studio, science lab (featuring a giant coral-reef aquarium! ), visual arts and ceramics studios, teaching kitchen, music room, and the coolest new lounge in Lower Manhattan! Throughout the ordeal, we were able to continue to employ our Center staff in various roles - no layoffs - so that familiar and knowledgeable people were waiting to greet our community when they came to our programs. Our financial assistance to families also continued without interruption, and we stood ready to help families and children who may be facing special challenges during that time. In 32 years, we have grown from offering a weekend sports program to offering a schedule of over 500 classes and events per week across multiple facilities in Lower Manhattan. Our thirty two current Manhattan Youth After-School Programs are integral to each child's public-school education, providing a rich balance of arts, athletics and academic enrichment activities on every day that school is in session. Our School Vacation Camps and our age- and interest-differentiated summertime Downtown Day Camps provide families with all-day children's programming when school is not in session. In addition, we operate sports leagues, aquatics programs, art programs, and music programs. We mount full-scale theater productions of classic plays and original works by our teens, dance productions involving kids of all ages, and in the warmer months we offer a great getaway on Pier 25 in Hudson River Park, where you can enjoy great Mini-Golf, Beach Volleyball, and delicious food from our Sweet Love Snack Bar. We provide nearly $600,000 in after-school assistance to families in need and free after-school programs, and an additional $300,000 in free and subsidized programs each year to Seniors, Teens, families and adults; programs that stimulate, educate, and build community in a safe, secure environment. We consistently balance our annual budget of more than $8 million, and we must continue to expand over the next several years to meet our community's growing needs. Manhattan Youth is a remarkable story of people who love their community and come together to get things done - through a mixture of hard work, positive energy and good humor. Our volunteer Board of Directors and our hundreds of staff members use these tools every day to care for our children, families, seniors, teens and everyone as we continue to build and grow with our community.